McDonald’s Corp. officials in Japan bowed deeply yesterday to apologize for a human tooth, plastic pieces and other objects found in the burger chain’s food, highlighting how consumers here are both loving and hating the fast-food eatery. The hubbub over objects turning up in the food comes on the heels of a different kind of problem at the popular chain — a lack of fries, stemming from a shortage set off by labor disruptions on the U.S. West Coast. Last year, McDonald’s in China and Japan along with other fast-food brands were hit by a scandal over expired meat from a Chinese supplier. In the recent cases, a child’s mouth was injured by a piece of plastic in an ice cream sundae in December. The fragment had fallen into the dispenser while being assembled, according to McDonald’s. In another case, a customer who bought a Big Mac set in August last year found a tooth in the fries. McDonald’s said none of its employees at the outlet or its suppliers had lost a tooth, and there were no signs the tooth had been fried. It was still investigating how the tooth and plastic got in the food. Aoki denied such cases highlighted an overall quality-control problem and called them “isolated” cases. He acknowledged there were other cases, including metal in a pancake and plastic in a McMuffin, but declined to give a tally of the incidents. He said it was possible that outsiders had planted the tooth and other items. In two other cases, pieces of plastic were found in the Chicken McNuggets, delivered from a plant in Thailand. One was blue, and so it could have fallen in during production, but the other was clear, a type not used at McDonald’s, officials said. “I will eat McNuggets. I will feed McNuggets to my children. I have no doubts,” said Aoki. 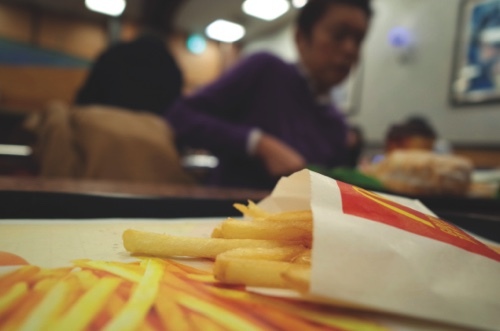 McDonald’s is popular in Japan, running more than 3,000 restaurants.